The heart symbol has long been a representation of friendship, devotion, romance and course love. This theme has been used for centuries in various different ways, commonly in modern times as an emoji. The heart, when presented as jewelry, will get an unexpected effect. This post will show you the dazzling heart cut wedding rings. The symbol first becomes popular in the 15th century, it began to be widely used in jewelry design, and often as a gift from kings to their queens. Till now, the heart means a timeless gift, perfect for any of anniversary celebration as a way of saying ‘I love you’. If you’re about to celebrate a special day, check the Jeulia two-tone heart cut wedding ring sets. The ring can be worn stacked with engagement or wedding rings. 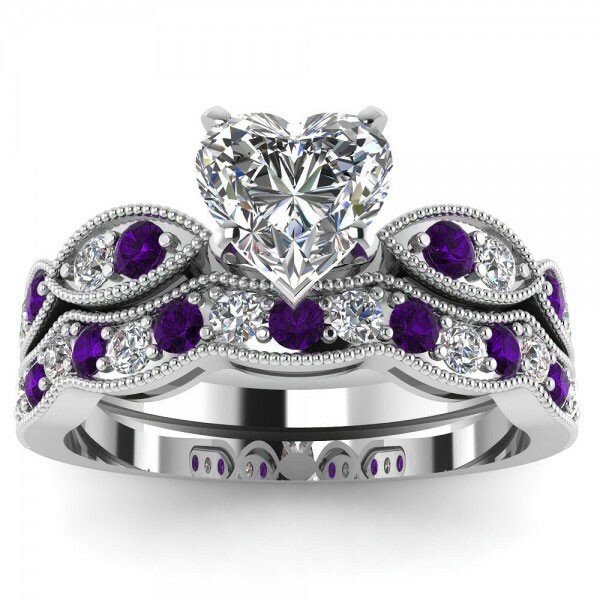 Here is jeulia hot selling heart cut wedding rings collection, Amethyst means a romantic love story, pink means a cute love story and you are willing to be her knight forever, sapphire represents the pure love story and nothing can separate you. There are plenty of heart cut wedding rings on jeulia.com, and they are affordable.